A range of massages to make you feel relaxed and take away the strains of everyday life. replenish as they firm, detoxify and relax the body . in the body and mind leaving you feeling calm and rebalanced. muscles and leave you feeling fresh and clear headed. Clarins Dynamisante and Clarins relax oil. you into a deep sense of relaxation. to ease tension, stress and relax tired muscles. to pressure points on the face and scalp. 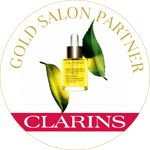 When you book an appointment with a Clarins Gold Salon you can be sure that you will receive the highest standard of Clarins service and treatment in one of the countries leading privately owned beauty salons.